First let’s say that that grass never stops growing, it only slows down. Grass growth begins at 5°C and as the temperature rises so does the rate of leaves appearing. In mid-summer a new leaf can appear every 7 days but during winter this can take as long as 35 days. As the soil and air temperatures drop the rate of grass growth slows. So mowing for the last time is more about weather and ground conditions. As we get into the autumn months the frequency of mowing will reduce from twice a week or more normally to once a week, to once every 10 days then down to once a fortnight and finally down to once a month in the month of November depending on where you are. The idea is to top the grass, never cut too short in the winter. It is just keeping the lawn tidy over the winter months. If you live in a mild area you may be able to top your grass in December but for most people it will be late October or November. Never cut grass with frost on or it will damage the grass, that crunchy sound as you walk is the blades breaking and bruising. Winter means the grass will take a very long time to repair itself. Before winter approaches it is also a good idea to apply a grass fertiliser to strengthen and protect it from the hard conditions over winter. You could use a liquid grass feed specifically for autumn use like The Grass People's LIQUID: Autumn/Winter - it has natural seaweed and fertiliser with iron and acts as a winter tonic. You could also consider The Grass People's SLOW RELEASE: Autumn/Winter Feed - it will strengthen grass roots and leaves to give protection throughout the winter resulting in a healthier sward the following spring. Also remember to give your lawnmower the once over before storing. A good brush down and some oil on blades is enough to keep in condition for next spring. 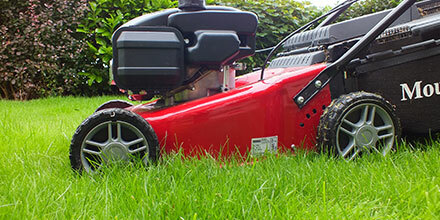 Ideally you could leave your mower in to be serviced and that means you will be well ahead come spring, ready to go. Topped Up: Feed a suitable fertiliser to help grass over the winter months. Tidy: Keep lawn tidy and clear of autumn debris. Trimmed: Keep cutting grass but not too short. Checkout the full range of fertilisers offered by The Grass People.